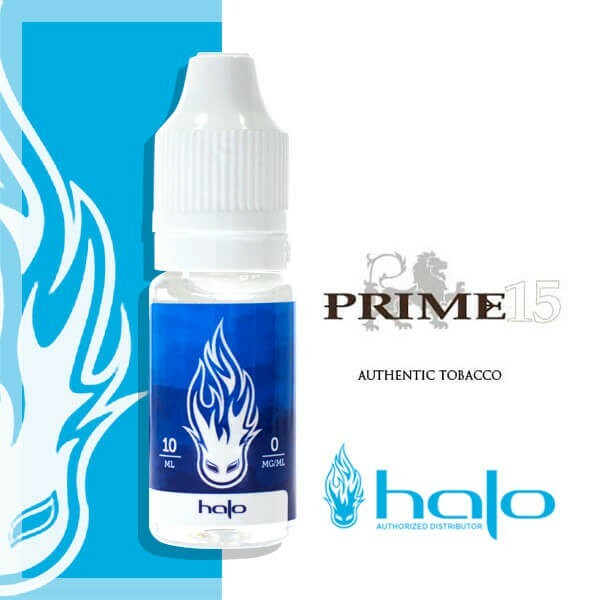 Halo Prime 15 e-liquid has an authentic Classic taste that reminds you of the complex nuances of a cigarette. Subtle sweetness and dry with undertones of cacao. Available in 10ml, 3x10ml. Halo, is an American Brand in reference with materials of e-liquid, we propose a range of premium e-liquids which have been elaborated and handled with care. Discover a collection of e-liquids with a well-marked identity which have been created from balanced and refined blends that will not leave you any indifferent. The Halo e-liquids are diacetyl free, paraben free ambrox free. For the manufacturing of the Halo e-liquids, use only quality pharmaceutical ingredients to the purest and highest degree possible. Propylene Glycol and Vegetable Glycerine have the property to create vapor. The natural aromas bring the taste. The Nicotine is in the form of liquid nicotine: it helps getting the hit (throat contraction when the vapor passes). To recharge the e-liquid of your Electronic Cigarette, unscrew the base of your atomiser and fill the tank 3/4 by tilting your atomiser to 45° without pouring liquid into the central tube. For an optimum preservation of the flavours, keep your HALO juices protected from light, in a dry place, and at room temperature (around 20°C). Shake well before use and do not hesitate to ventilate (open the plug) your HALO e-liquid for a few days before using it for a better restitution of the flavours. 12 mg/ml of nicotine: DANGER - R21 Toxic in contact with skin. 18 mg/ml of nicotine: DANGER - R24 Toxic in contact with skin. Aucune idée, je ne suis pas taste-e-liquide... Je ne saurais dire s'il a de la cuisse ou est gouleyant, uniquement que j'aime ce goût !